The Pikes Peak Regional Water Authority will sponsor a $190,000 grant request to the Colorado Water Conservation Board to form a task force that water leaders from around the state decided was needed at a meeting in Silverthorne [ed. June 29]. The task force would be made up of members of the state’s nine basin roundtables, along with environmental and recreation interests. It also could include some of the state’s top water officials, and could have 20 to 23 members. The plan, however, still requires buy-in from the roundtables, which were formed by the Legislature in 2005 to sort out state water issues. The needs assessment committee of the Arkansas Basin Roundtable met Thursday and agreed to move the Flaming Gorge task force proposal to the full roundtable at its Aug. 10 meeting. All of the money would come from the water supply reserve account, a program funded by mineral severance taxes. The Arkansas Basin Roundtable would use $10,000 from its basin fund, along with $30,000 from the Metro roundtable. The rest of the grant would come through a statewide account. “As a state, we need to move forward and identify new projects that bring water into the state,” said Alan Hamel, who represents the Arkansas River basin on the CWCB. 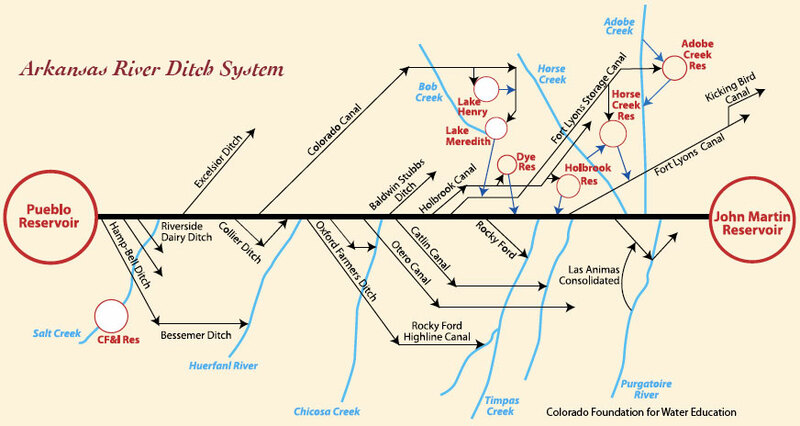 “The task force will ask if (Flaming Gorge) is doable and determine how it fits in with the state water supply,” [Jim Broderick, another member of the needs assessment committee] said. he water district will pay three sellers $1.79 million for 41.2 shares of High Line Canal water rights if the sales are closed following due diligence investigations. The purchase would amount to $4,300 per acre. A smaller water right is also included in the package. The farms are a small part of the High Line’s 2,250 shares, and all are near the end of the 85-mile long ditch in Otero County. 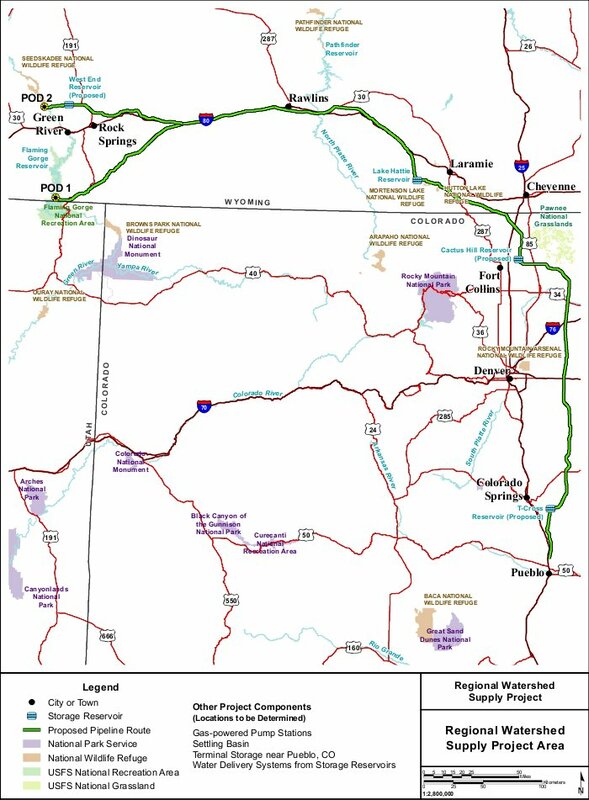 The High Line diverts south of the Arkansas River east of Boone and ends at Timpas Creek. Woodmoor, a part of the [Pikes Peak Regional Water Authority], dropped out of Super Ditch negotiations because of the objections to taking water over the Palmer Divide. Woodmoor district manager Jessie Shaffer wrote a letter addressed to the authority suggesting the district stay out of the negotiations with the ditch due to a possible conflict with a recent filing for an exchange plan for water in the Lower Arkansas Valley. The letter was written under the direction of the water and sanitation district’s governing board, said assistant district manager Randy Gillette. “They have given us direction that we don’t have to be involved with these negotiations,” Gillette said. “We do want to be a part of the Super Ditch concept […] but it’s always been stated, at least what I’ve heard, is that individual contracts are going to be the bottom line.” In exchange for stepping away from the issue, the water purveyor also wanted to be excluded from the costs associated with the authority’s negotiations with the Super Ditch. More Super Ditch coverage here and here. 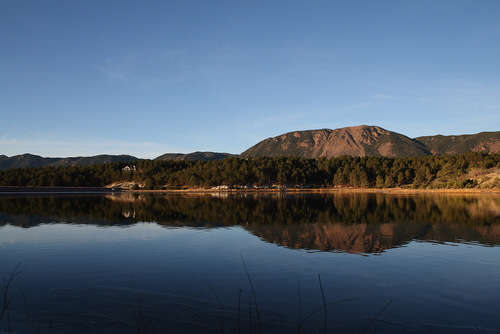 Cracks in the Pikes Peak Regional Water Authority? At the group’s Jan. 20 meeting, Cherokee Metropolitan District general manager Kip Petersen said Woodmoor Water and Sanitation District’s filing for an exchange plan for water in the Lower Arkansas Valley and a letter sent to Aaron Million expressing interest in his project came as surprises to him. Million, a Colorado entrepreneur, is working on a privately studied, built and funded project to pipe water from the Flaming Gorge Reservoir in Utah and Wyoming to areas along the Front Range. The exchange plan filing came as a surprise to several members of the authority and some thought it could hurt the group’s negotiations with projects it is looking at to potentially provide the area with renewable water. “I’m pretty sure that’s hurt our credibility with the Super Ditch people,” Petersen said. 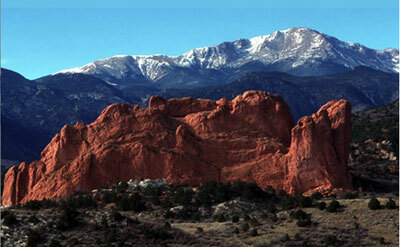 More Pikes Peak Regional Water Authority coverage here. The Pikes Peak Regional Water Authority continued discussions about its options for a future water source and it appears it will be a while before it can determine what its best course will be…Regardless of which project or projects the authority ultimately chooses, it will need to find a place to store the water. The authority has a few options, including the Pueblo Reservoir, but no storage location has been finalized.